Several years ago, while walking through the dense chaparral vegetation of southern California at mid-day, I became aware of a sound, like a gentle rain on the arid vegetation. When I paused and stilled my breathing, my ears were able to pinpoint the source of this patter. A large shrub, Ceanothus crassifolius (Rhamnaceae), one of the California lilacs, was dispersing its seeds. 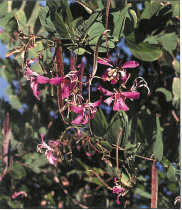 The capsules popped open in the dry California sunshine, flinging their shiny seeds in all directions. The ricochet of small seeds on the tough, stiff leaves of the Ceanothus was the sound creeping into my consciousness. I had a similar experience some years later while biking along Old Cutler Road, near the Garden. During a lull in traffic and over the rattle of my bike gears, I heard what sounded like pebbles falling on the road. I stopped my bike and traced this strange clatter to its source: A large orchid tree, Bauhinia purpurea, growing on the other side of the road, was releasing its seeds. In the heat of the day, the pods were popping open, scattering seeds in a steady rain around the tree. The seed rain was audible all the way across Old Cutler Road. When I consulted a scientific treatise on seed dispersal, I learned that the dispersal of Bauhinia purpurea seeds has been measured. It can throw its seeds almost 50 feet! These plants have a common mode of seed dispersal. Rather than rely on animals or wind to move their seeds, they throw them by the sudden, explosive opening of their fruits. This mode of seed dispersal is called “ballistichory”, and seeds thus dispersed are called “ballistochores”. Crossandra infundibuliformis produces showy salmon colored flowers followed by small capsules that pop open in a moist environment. Many plants, both tropical and temperate, rely on ballistichory to disperse their seeds. One interesting example from the tropics is the genus Pentaclethra, a relative of Bauhinia. An experienced botanist reported that Pentaclethra was the only plant he knew whose pods opened so explosively and forcefully that they could break the sturdy oaken presses that botanists use to press and dry their plant specimens. For all its press-shattering strength, Pentaclethra throws its seeds only about 33 feet from the parent tree, which, ironically, is not as far as the gentle Bauhinia. Just for the record, the world champion ballistics title belongs to an African tree in the Legume family, Tetraberlinia moreliana, which throws its seeds almost 200 feet! All of these plants rely on the drying of the fruit wall to generate tension. The wall of a ballistic fruit has at least two layers in which the woody fibers are oriented in different directions, usually at right angles. As the woody fibers dry, the layers pull against each other. When at last the fruit fractures along a predetermined seam or weak spot, the walls curl, throwing the seeds a considerable distance. In legumes, the bean pod splits along two natural seams, and the two halves curl into a corkscrew shape, flinging out seeds in the process. The flattened inflorescences of Dorstenia sp. squeeze out seeds and shoot them several inches. It is the drying of the fruit that supplies the tension. Were it not so, Australia would have exploding emu birds. Yes, you read that right. A favorite food of the flightless emu is Petalostigma pubescens, a tree in the Euphorbia family with fleshy fruits, each of which contains six to eight stones, or endocarps, which contain the seeds. An emu may eat dozens of fruits in one meal and range over a large territory, defecating endocarps as it goes. In one of science's least glamorous moments, Australian biologists counted as many as 142 endocarps in one emu dropping. Emus may eat the fresh fruits of Petalostigma with impunity, but a surprise occurs once the excreted endocarps begin to bake in the hot, outback sun. As the endocarps dry, they explode. 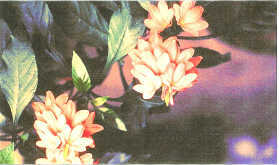 The sudden explosion may send seeds up to three feet from the point of origin. In an even more bizarre twist to the story, biologists found that each seed bears a small, oily food body that is attractive to ants, which ultimately move the seeds and disperse this plant. The association between emus, ants, and the exploding endocarps of Petalostigma probably represents one of the most complicated dispersal scenarios in the plant kingdom. The fruits of Hura crepitans are segmented like a tangerine and sound like a gun shot when they explode. In the use of ballistichory for seed dispersal, one family, the Acanthaceae, stands out. Nearly all the members disperse their seeds explosively. This large, mostly tropical and subtropical family has several members that are familiar to gardeners in warm climates, including Ruellia, Justicia, and Crossandra. The capsules of Crossandra infundibuliformis, a common ornamental in the Acanthaceae, are among my favorites. As a youngster, I delighted in inviting my unsuspecting elders to place a ripe Crossandra capsule under their tongues. After a few moments in a warm, moist environment, the capsules would pop open, startling my victims and causing no end of glee in this young botanist. 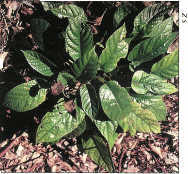 Unlike the capsules of the plants discussed so far, mature Crossandra capsules must first dry out and then become moist again before they explode (one layer of tissue absorbs water faster than the other layer, thus generating the tension). From the seed's point of view, it's better to wait out the dry season in the pod and disperse only when there is moisture enough for germination. In all the cases mentioned so far, tension is generated in dried (dead) tissue, but sometimes it is living tissue that exerts force. Dorstenia is a genus of plants native to the tropics and closely related to figs (Ficus). Like figs, Dorstenia has tiny flowers that are arranged on a fleshy receptacle. In Dorstenia, the receptacle is platter-like, with hundreds of tiny flowers embedded in its upper surface; like canapes on a plate. As the flowers mature into fruits, the dispersal mechanism of Dorstenia becomes apparent. The fruits are squeezed by the surrounding fruits and receptacle tissue, and the seeds are shot out, much as I used to shoot slippery watermelon seeds at my sister. Touching a gravid Dorstenia infructescence launches a volley of tiny seeds. For sheer ballistic verve, we look to another tropical plant, one that is also cultivated in South Florida. 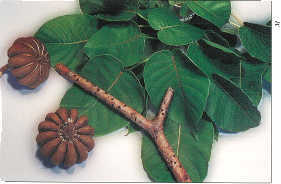 It is Hura crepitans, the sandbox tree of the Euphorbiaceae. It has capsules the size and shape of tangerines. Each fruit has many segments, just as does a tangerine, and each fruit segment contains a seed the size of a nickel. When the fruits burst open, they shoot their seeds nearly 150 feet, accompanied by an explosive noise that is said to sound like the discharge of a rifle! We may be forgiven if we sometimes think plants are passive, demure, deferential creatures, but the plants that disperse by ballistichory blow that illusion right out of the water.